Description: For the purists, we offer our finest aged balsamic vinegar from Modena, Italy. For over 100 years, the producer of our traditional balsamic has been producing fine balsamics of exceptional quality. Produced with natural methods and from grapes with low environmental impact, this beautiful balsamic is cask-aged for up to 18 years using the Solera Method in chestnut, oak, mulberry, and ash barrels. Our Traditional Balsamic vinegar contains NO preservatives, NO colours, NO caramel, NO thickening agents, and NO added sugars. Only a couple of drops of this fine balsamic will leave you and your guests with lasting impressions. With this exceptional balsamic we offer you a verifiably caramel color-free authentic product made exclusively in Modena Italy. It is truly artisan crafted to be identical to Traditional Extra Vecchio DOP in both flavor and chemical composition. We have been able to accomplish this by demanding the highest proportion of barrel aged, kettle-cooked grape must in our products crafted in Modena, Italy. The increase in grape must correlates to the increase in total carbohydrates in our balsamic. Our UP Traditional style balsamic is now comprised of over 97% cooked, cask-aged grape must, which has been prepared through a traditional "batteria". This also equates to a higher amount of grape solids in our product. These solids (when measured in total) also include the natural fruit sugar which originates solely from grapes. While the total solids in our products equate to more carbs, the grape solids (when measured in isolation without their natural sugar included) correspond to a high concentration of natural phenols in our products. These phenols are currently being measured at the most proficient balsamic labs in the world, and we are studying their nature with leading scientific experts in Modena, Italy. We know that naturally fermented products such as balsamic vinegar have long been touted as health promoting due to their pro-biotic nature. We also intend to better understand the health implications associated with consuming grape phenols as our products have the highest amount of grape solids measured (minus grape sugar) of any other balsamic product available. Tasting Profile / Serving Suggestions: The flavour of this balsamic is unforgettable. A very well-balanced acidity and sweetness create incredible sensations on the palate. Generally reserved for your finest dishes and occasions, its thick texture makes this balsamic ideal with ripe cheeses, over grilled meats, and over fresh strawberries and poached pears. This rich, dark balsamic can be used as a dessert topping, a salad dressing base, or as an everyday condiment! 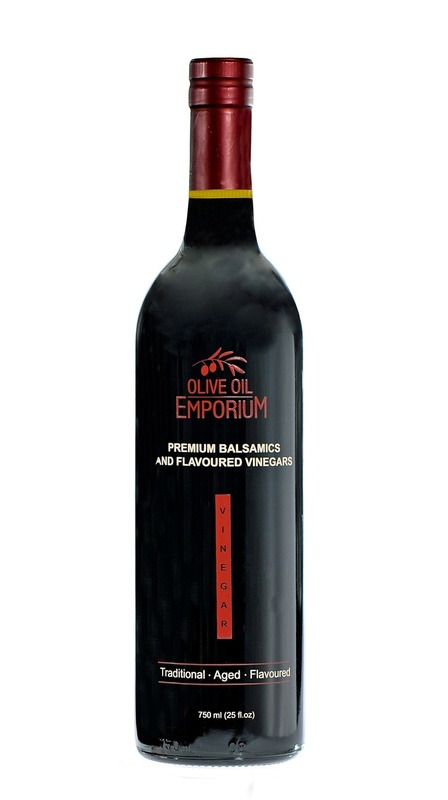 A balsamic to be paired with any of our olive oils, and simply divine on its own.